This locomotive began life in 1930 as a 2-8-0T, built to GWR lot No. 266 and numbered 5275. The class was built to service the South Wales coal traffic and performed this work very capably, being popular with the drivers who found their great adhesive weight most useful on the steeply graded lines of the Welsh valleys. However, the South Wales coal traffic was falling off as a result of the depression, and consequently many of the class had little work. Normally in a situation like this the class would have been simply transferred elsewhere. This could not be done with the 2-8-0s due to their small coal and water capacity. The GWR solved the problem by converting some of the class to 2-8-2Ts to enable them to carry more fuel. The work was carried out at Swindon, starting with 5275, which returned to traffic as a 2-8-2T, numbered 7200 in August 1934. The converted locos found work in most parts of the GWR system, where their great weight (92 tons 12 cwt) was allowed, indeed many of them were used in the Home Counties, particularly on the iron ore trains from Banbury. However their weight and long wheelbase did cause some concern and they were banned from certain marshalling yards with tight curves. 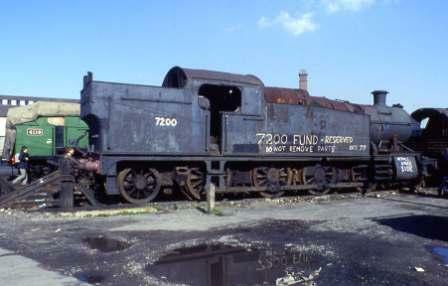 7200 was withdrawn from Llanelly shed in July 1963, sold to Woodham Brothers for scrap, and delivered to their yard in Barry Docks during November of that year. 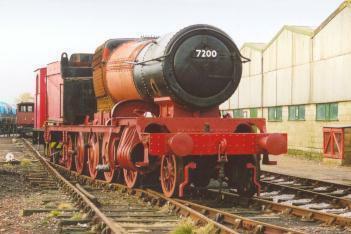 The yard at Barry was the saviour of many engines and 7200 was recovered in 1980. Our example of Britain's largest type of tank locomotive was 'mothballed' for a number of years, due to the lack of manpower and finance. However work has now commenced in anger, and hopefully it will not be too long before the Buckinghamshire countryside will echo to its thunderous exhaust. The rolling chassis was restored at Swindon Works, and now has the distinction of being the last locomotive to leave the once eminent GWR works, closing 165 years of railway history. The rolling chassis is virtually complete with the inside motion and brake gear complete. The sidebars and crossheads have been fitted, with installation of the connecting rods also completed. New tanks have been installed, as has a virtually new bunker. The cab is also being repaired, hopefully being refitted shortly. The chimney and blower ring and many other parts have been made new. Full details of progress to this aim can be found on 7200's own website, and facebook page maintained by the 7200 Trust. Cylinder Dimensions :- 19" x 30" Weight :- 92t 12c Driving Wheel Dia. :- 4' 7½"